When I asked you guys what kind of gift guides you want to see this season a TON of you asked for a college one! 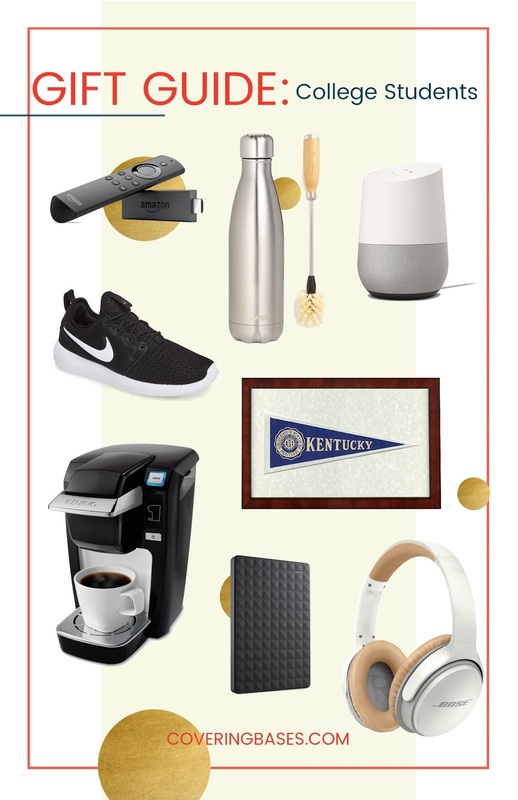 Either you're in college, obsessed with college (like me) or know someone who is and need to shop for them. I gotchu covered! Amazon Fire Stick: What college student doesn't want to binge watch TV all day? With the stick you can get all your streaming channels in one place. Andrew's parents have it and absolutely love it. I think when we finally cut the cord we're going to do the same. S'well Bottle: I use my S'well bottle ALL the time for work. I can only image how much healthier I could have been if I had one in college. This keeps your drink cold or hot for HOURS, and as I've learned from experience, they're pretty indestructible. Bottle Brush: I need to actually grab one of these for our S'well bottles at home (we have like 6) because the only way to clean them is by hand and as you can imagine, not much fits down the narrow opening of the bottle. That's why they designed the bottle cleaner! This is a great gift for just about anyone who owns a S'well bottle. Google Home: We're an Alexa family but if the Google home had come out first I think we would have a different mindset. I think the home is just *cool* and very in right now so what college student wouldn't want one? I feed like anything that makes your life easier in college is a win. Nike Sneakers: Not sure about where you went to school but having the coolest pair of Nikes was a big deal. I wore my sneakers all the time (with an XL t-shirt and Nike shorts) and even now that I'm out of college, having this pair of sneakers are really helpful! College Pennant: This is actually something that I want personally for my apartment but it would also be a great idea for any soon-to-be grads or alumni. I love the vintage look and how it's a cool (and classy) way to rep your school. Mini Coffee Maker: I don't drink coffee but my roommates always did (and still do) so I know this would be a great gift for anyone living in a small space (or NYC apartment). The reviews are amazing and with this you have the perfect stocking stuffer: K-cups! External Hard Drive: This is more of a "boring" gift but one that is SO essential to just about everyone -- back up your stuff!! Living in the digital age everything is on our computers -- photos, videos, papers -- and things can go bad quickly. Maybe your computer is lost or gets stolen or you have an accident and it's ruined. All of these have happened to people I know and there is nothing worse than not having a backup to your stuff. It's essential! Bose Headphones: Any noise-canceling headphones work but these look super cool. Roommates, dorm mates (dorms in general) can be noisy and sometimes you just want to watch YouTube videos for hours in peace. This will help! Or maybe you need to drown out the noise of the library with some classical music (like me) and these will help save your grade.